Believe the tales they told you...every word is true. There are trees in the heart of the forest older than mortal memory. They have seen the coming of the demons from the sea, the one-eyed creatures pursued by the great evil. They have seen the Fair Folk dance across the void, filling the land with their servants. They have seen cruelty, violence and fear. Still they watch, as the mortals rebuild their world, and countless strange and terrible creatures watch along with them from the darkness of the woods. 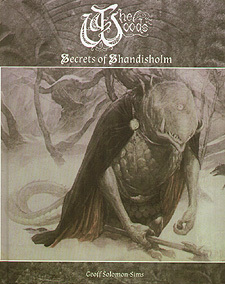 Secrets of Shandisholm is a sourcebook for tabletop roleplay, set in the world of The Woods. Inside you'll find everything you'll need to explore the forests and fens of Shandisholm, with their shadowy and mysterious denizens, including the history of the Mortal Realm, and extensive bestiary, modelling articles and ideas for scenarios and storylines. Also included are complete rules for SystemMech, the chance-free tabletop RPG from Oakbound Studio. Skills, Traits, and Item lists and a new Action Table for Fateweaving expands the core rules for using SystemMech in the world of The Woods. A range of miniatures and gaming aids to accompany this book are available from Oakbound Studio.